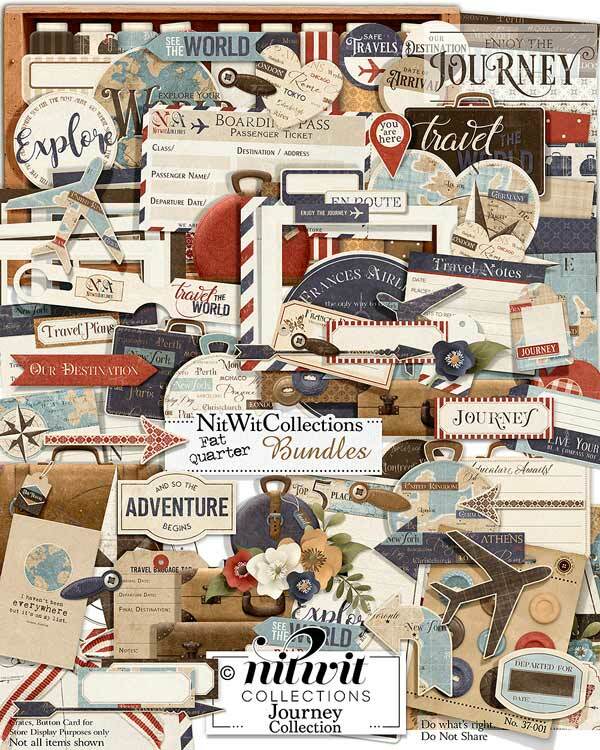 FQB "Journey" Collection takes you over land and sea and lets you capture all that our wonderful world has to offer with this vintage travel digital scrapbook kit and card making kit! 8 Well adorned arrows, some with phrases and some more elegantly designed....where you will point to?? 8 Buttons in varying styles and colours...did you pack your sewing kit?? 1 Chipboard suitcase - "Travel the World"
1 Circle element with a writeable area for you to fill in - "Our Destination"
1 Circle element with a writeable area - "Date of Arrival"
1 Corner cluster of elements to add such interest to any corner, background paper or card front. Talk about inspiration and easy design! 5 Frames, for photos or other unique design elements! Why not place a main element or continental background paper of the region you travelled to in this frame....the sky's the limit! 1 Vintage journal card - "I haven't been Everywhere, but....."
1 Journal card - "Top 5 Places I Want to Visit"
1 Journal card - "Travel Plans" with titled areas for you to personalize such as dates, companions, destination, etc. 1 Label - "And so the Adventure Begins"
1 Vintage label - "Enjoy the Journey"
1 Luggage tag a MUST USE element!! 5 Vintage suitcases, both in style and look....it really takes you back!